A futures contract is a standardized agreement between a buyer and a seller to exchange an amount and grade of an item at a specific price and future date. The item or underlying asset may be an agricultural commodity, a metal, mineral or energy commodity, a financial instrument or a foreign currency. Because futures contracts are derived from these underlying assets, they belong to a family of financial instruments called derivatives. Traders buy and sell futures contracts on an exchange – a marketplace that is operated by a voluntary association of members. The exchange provides buyers and sellers the infrastructure (trading pits or their electronic equivalent), legal framework (trading rules, arbitration mechanisms), contract specifications (grades, standards, time and method of delivery, terms of payment) and clearing mechanisms (see section titled The Clearinghouse) necessary to facilitate futures trading. Only exchange members are allowed to trade on the exchange. Nonmembers trade through commission merchants – exchange members who service nonmember trades and accounts for a fee. The September 2004 light sweet crude oil contract is an example of a petroleum (mineral) future. It trades on the New York Mercantile exchange (NYM). The contract is standardized – every one is an agreement to trade 1,000 barrels of grade light sweet crude in September, on a day of the seller’s choosing. As of May 25, 2004 the contract sold for $40,120=$40.12x1000 and debits Member S’s margin account the same amount. The clearinghouse is the counterparty to every trade – its members buy every contract that traders sell on the exchange and sell every contract that traders buy on the exchange. Absent a clearinghouse, traders would interact directly, and this would introduce two problems. First, traders. concerns about their counterparty’s credibility would impede trading. For example, Trader A might refuse to sell to Trader B, who is supposedly untrustworthy. Second, traders would lose track of their counterparties. This would occur because traders typically settle their contractual obligations by offset – traders buy/sell the contracts that they sold/bought earlier. For example, Trader A sells a contract to Trader B, who sells a contract to Trader C to offset her position, and so on. The clearinghouse eliminates both of these problems. First, it is a guarantor of all trades. If a trader defaults on a futures contract, the clearinghouse absorbs the loss. Second, clearinghouse members, and not outside traders, reconcile offsets at the end of trading each day. Margin accounts and a process called marking-to-market all but assure the clearinghouse’s solvency. A margin account is a balance that a trader maintains with a commission merchant in order to offset the trader’s daily unrealized loses in the futures markets. Commission merchants also maintain margins with clearinghouse members, who maintain them with the clearinghouse. The margin account begins as an initial lump sum deposit, or original margin. To understand the mechanics and merits of marking-to-market, consider that the values of the long and short positions of an existing futures contract change daily, even though futures trading is a zero-sum game – a buyer’s gain/loss equals a seller’s loss/gain. So, the clearinghouse breaks even on every trade, while its individual members. positions change in value daily. With this in mind, suppose Trader B buys a 5,000 bushel soybean contract for $9.70 from Trader S. Technically, Trader B buys the contract from Clearinghouse Member S and Trader S sells the contract to Clearinghouse Member B. Now, suppose that at the end of the day the contract is priced at $9.71. That evening the clearinghouse marks-to-market each member’s account. That is to say, the clearinghouse credits Member B’s margin account $50 and debits Member S’s margin account the same amount. Member B is now in a position to draw on the clearinghouse $50, while Member S must pay the clearinghouse a $50 variation margin – incremental margin equal to the difference between a contract’s price and its current market value. In turn, clearinghouse members debit and credit accordingly the margin accounts of their commission merchants, who do the same to the margin accounts of their clients (i.e., traders). This iterative process all but assures the clearinghouse a sound financial footing. In the unlikely event that a trader defaults, the clearinghouse closes out the position and loses, at most, the trader’s one day loss. Futures exchanges create futures contracts. And, because futures exchanges compete for traders, they must create contracts that appeal to the financial community. For example, the New York Mercantile Exchange created its light sweet crude oil contract in order to fill an unexploited niche in the financial marketplace. Not all contracts are successful and those that are may, at times, be inactive – the contract exists, but traders are not trading it. For example, of all contracts introduced by U.S. exchanges between 1960 and 1977, only 32% traded in 1980 (Stein 1986, 7). Consequently, entire exchanges can become active – e.g., the New York Futures Exchange opened in 1980 – or inactive – e.g., the New Orleans Exchange closed in 1983 (Leuthold 1989, 18). Government price supports or other such regulation can also render trading inactive (see Carlton 1984, 245). Futures contracts succeed or fail for many reasons, but successful contracts do share certain basic characteristics (see for example, Baer and Saxon 1949, 110-25; Hieronymus 1977, 19-22). To wit, the underlying asset is homogeneous, reasonably durable, and standardized (easily describable); its supply and demand is ample, its price is unfettered, and all relevant information is available to all traders. For example, futures contracts have never derived from, say, artwork (heterogeneous and not standardized) or rent-controlled housing rights (supply, and hence price is fettered by regulation). Futures markets have three fundamental purposes. The first is to enable hedgers to shift price risk – asset price volatility – to speculators in return for basis risk – changes in the difference between a futures price and the cash, or current spot price of the underlying asset. Because basis risk is typically less than asset price risk, the financial community views hedging as a form of risk management and speculating as a form of risk taking. Generally speaking, to hedge is to take opposing positions in the futures and cash markets. Hedgers include (but are not restricted to) farmers, feedlot operators, grain elevator operators, merchants, millers, utilities, export and import firms, refiners, lenders, and hedge fund managers (see Peck 1985, 13-21). Meanwhile, to speculate is to take a position in the futures market with no counter-position in the cash market. Speculators may not be affiliated with the underlying cash markets. To demonstrate how a hedge works, assume Hedger A buys, or longs, 5,000 bushels of corn, which is currently worth $2.40 per bushel, or $12,000=$2.40×5000; the date is May 1st and Hedger A wishes to preserve the value of his corn inventory until he sells it on June 1st. To do so, he takes a position in the futures market that is exactly opposite his position in the spot – current cash – market. For example, Hedger A sells, or shorts, a July futures contract for 5,000 bushels of corn at a price of $2.50 per bushel; put differently, Hedger A commits to sell in July 5,000 bushels of corn for $12,500=$2.50×5000. Recall that to sell (buy) a futures contract means to commit to sell (buy) an amount and grade of an item at a specific price and future date. Absent basis risk, Hedger A’s spot and futures markets positions will preserve the value of the 5,000 bushels of corn that he owns, because a fall in the spot price of corn will be matched penny for penny by a fall in the futures price of corn. For example, suppose that by June 1st the spot price of corn has fallen five cents to $2.35 per bushel. Absent basis risk, the July futures price of corn has also fallen five cents to $2.45 per bushel. So, on June 1st, Hedger A sells his 5,000 bushels of corn and loses $250=($2.35-$2.40)x5000 in the spot market. At the same time, he buys a July futures contract for 5,000 bushels of corn and gains $250=($2.50-$2.45)x5000 in the futures market. Notice, because Hedger A has both sold and bought a July futures contract for 5,000 bushels of corn, he has offset his commitment in the futures market. This example of a textbook hedge – one that eliminates price risk entirely – is instructive but it is also a bit misleading because: basis risk exists; hedgers may choose to hedge more or less than 100% of their cash positions; and hedgers may cross hedge – trade futures contracts whose underlying assets are not the same as the assets that the hedger owns. So, in reality hedgers cannot immunize entirely their cash positions from market fluctuations and in some cases they may not wish to do so. Again, the purpose of a hedge is not to avoid risk, but rather to manage or even profit from it. The second fundamental purpose of a futures market is to facilitate firms’ acquisitions of operating capital – short term loans that finance firms’ purchases of intermediate goods such as inventories of grain or petroleum. For example, lenders are relatively more likely to finance, at or near prime lending rates, hedged (versus non-hedged) inventories. The futures contact is an efficient form of collateral because it costs only a fraction of the inventory’s value, or the margin on a short position in the futures market. The third fundamental purpose of a futures market is to provide information to decision makers regarding the market’s expectations of future economic events. So long as a futures market is efficient – the market forms expectations by taking into proper consideration all available information – its forecasts of future economic events are relatively more reliable than an individual’s. Forecast errors are expensive, and well informed, highly competitive, profit-seeking traders have a relatively greater incentive to minimize them. The Evolution of Futures Trading in the U.S. Into the early nineteenth century, the vast majority of American grains – wheat, corn, barley, rye and oats – were produced throughout the hinterlands of the United States by producers who acted primarily as subsistence farmers – agricultural producers whose primary objective was to feed themselves and their families. Although many of these farmers sold their surplus production on the market, most lacked access to large markets, as well as the incentive, affordable labor supply, and myriad technologies necessary to practice commercial agriculture – the large scale production and marketing of surplus agricultural commodities. At this time, the principal trade route to the Atlantic seaboard was by river through New Orleans4; though the South was also home to terminal markets – markets of final destination – for corn, provisions and flour. Smaller local grain markets existed along the tributaries of the Ohio and Mississippi Rivers and east-west overland routes. The latter were used primarily to transport manufactured (high valued and nonperishable) goods west. Most farmers, and particularly those in the East North Central States – the region consisting today of Illinois, Indiana, Michigan, Ohio and Wisconsin – could not ship bulk grains to market profitably (Clark 1966, 4, 15).5 Instead, most converted grains into relatively high value flour, livestock, provisions and whiskies or malt liquors and shipped them south or, in the case of livestock, drove them east (14).6 Oats traded locally, if at all; their low value-to-weight ratios made their shipment, in bulk or otherwise, prohibitive (15n). The Great Lakes provided a natural water route east to Buffalo but, in order to ship grain this way, producers in the interior East North Central region needed local ports to receive their production. Although the Erie Canal connected Lake Erie to the port of New York by 1825, water routes that connected local interior ports throughout northern Ohio to the Canal were not operational prior to the mid-1830s. Indeed, initially the Erie aided the development of the Old Northwest, not because it facilitated eastward grain shipments, but rather because it allowed immigrants and manufactured goods easy access to the West (Clark 1966, 53). By 1835 the mouths of rivers and streams throughout the East North Central States had become the hubs, or port cities, from which farmers shipped grain east via the Erie. By this time, shippers could also opt to go south on the Ohio River and then upriver to Pittsburgh and ultimately to Philadelphia, or north on the Ohio Canal to Cleveland, Buffalo and ultimately, via the Welland Canal, to Lake Ontario and Montreal (19). Before the mid-1860s, a network of banks, grain dealers, merchants, millers and commission houses – buying and selling agents located in the central commodity markets – employed an acceptance system to finance the U.S. grain trade (see Clark 1966, 119; Odle 1964, 442). For example, a miller who required grain would instruct an agent in, say, New York to establish, on the miller’s behalf, a line of credit with a merchant there. The merchant extended this line of credit in the form of sight drafts, which the merchant made payable, in sixty or ninety days, up to the amount of the line of credit. With this credit line established, commission agents in the hinterland would arrange with grain dealers to acquire the necessary grain. The commission agent would obtain warehouse receipts – dealer certified negotiable titles to specific lots and quantities of grain in store – from dealers, attach these to drafts that he drew on the merchant’s line of credit, and discount these drafts at his local bank in return for banknotes; the local bank would forward these drafts on to the New York merchant’s bank for redemption. The commission agents would use these banknotes to advance – lend – grain dealers roughly three quarters of the current market value of the grain. The commission agent would pay dealers the remainder (minus finance and commission fees) when the grain was finally sold in the East. That is, commission agents and grain dealers entered into consignment contracts. Unfortunately, this approach linked banks, grain dealers, merchants, millers and commission agents such that the “entire procedure was attended by considerable risk and speculation, which was assumed by both the consignee and consignor” (Clark 1966, 120). The system was reasonably adequate if grain prices went unchanged between the time the miller procured the credit and the time the grain (bulk or converted) was sold in the East, but this was rarely the case. The fundamental problem with this system of finance was that commission agents were effectively asking banks to lend them money to purchase as yet unsold grain. To be sure, this inadequacy was most apparent during financial panics, when many banks refused to discount these drafts (Odle 1964, 447). Amidst this growth of Lake Michigan commerce, a confluence of innovations transformed the grain trade and its method of finance. By the 1840s, grain elevators and railroads facilitated high volume grain storage and shipment, respectively. Consequently, country merchants and their Chicago counterparts required greater financing in order to store and ship this higher volume of grain.9 And, high volume grain storage and shipment required that inventoried grains be fungible – of such a nature that one part or quantity could be replaced by another equal part or quantity in the satisfaction of an obligation. For example, because a bushel of grade No. 2 Spring Wheat was fungible, its price did not depend on whether it came from Farmer A, Farmer B, Grain Elevator C, or Train Car D.
The largest and most prominent of these exchanges was the Board of Trade of the City of Chicago, a grain and provisions exchange established in 1848 by a State of Illinois corporate charter (Boyle 1920, 38; Lurie 1979, 27); the exchange is known today as the Chicago Board of Trade (CBT). For at least its first decade, the CBT functioned as a meeting place for merchants to resolve contract disputes and discuss commercial matters of mutual concern. Participation was part-time at best. The Board’s first directorate of 25 members included “a druggist, a bookseller, a tanner, a grocer, a coal dealer, a hardware merchant, and a banker” and attendance was often encouraged by free lunches (Lurie 1979, 25). However, in 1859 the CBT became a state- (of Illinois) chartered private association. As such, the exchange requested and received from the Illinois legislature sanction to establish rules “for the management of their business and the mode in which it shall be transacted, as they may think proper;” to arbitrate over and settle disputes with the authority as “if it were a judgment rendered in the Circuit Court;” and to inspect, weigh and certify grain and grain trades such that these certifications would be binding upon all CBT members (Lurie 1979, 27). By the 1850s traders sold and resold forward contracts prior to actual delivery (Hieronymus 1977, 75). A trader could not offset, in the futures market sense of the term, a forward contact. Nonetheless, the existence of a secondary market – market for extant, as opposed to newly issued securities – in forward contracts suggests, if nothing else, speculators were active in these early time contracts. On March 27, 1863, the Chicago Board of Trade adopted its first rules and procedures for trade in forwards on the exchange (Hieronymus 1977, 76). The rules addressed contract settlement, which was (and still is) the fundamental challenge associated with a forward contract – finding a trader who was willing to take a position in a forward contract was relatively easy to do; finding that trader at the time of contract settlement was not. The CBT began to transform actively traded and reasonably homogeneous forward contracts into futures contracts in May, 1865. At this time, the CBT: restricted trade in time contracts to exchange members; standardized contract specifications; required traders to deposit margins; and specified formally contract settlement, including payments and deliveries, and grievance procedures (Hieronymus 1977, 76). The inception of organized futures trading is difficult to date. This is due, in part, to semantic ambiguities – e.g., was a “to arrive” contract a forward contract or a futures contract or neither? However, most grain trade historians agree that storage (grain elevators), shipment (railroad), and communication (telegraph) technologies, a system of staple grades and standards, and the impetus to speculation provided by the Crimean and U.S. Civil Wars enabled futures trading to ripen by about 1874, at which time the CBT was the U.S.’s premier organized commodities (grain and provisions) futures exchange (Baer and Saxon 1949, 87; Chandler 1977, 212; CBT 1936, 18; Clark 1966, 120; Dies 1925, 15; Hoffman 1932, 29; Irwin 1954, 77, 82; Rothstein 1966, 67). Nonetheless, futures exchanges in the mid-1870s lacked modern clearinghouses, with which most exchanges began to experiment only in the mid-1880s. For example, the CBT’s clearinghouse got its start in 1884, and a complete and mandatory clearing system was in place at the CBT by 1925 (Hoffman 1932, 199; Williams 1982, 306). The earliest formal clearing and offset procedures were established by the Minneapolis Grain Exchange in 1891 (Peck 1985, 6). Even so, rudiments of a clearing system – one that freed traders from dealing directly with one another – were in place by the 1870s (Hoffman 1920, 189). That is to say, brokers assumed the counter-position to every trade, much as clearinghouse members would do decades later. Brokers settled offsets between one another, though in the absence of a formal clearing procedure these settlements were difficult to accomplish. Direct settlements were simple enough. Here, two brokers would settle in cash their offsetting positions between one another only. Nonetheless, direct settlements were relatively uncommon because offsetting purchases and sales between brokers rarely balanced with respect to quantity. For example, B1 might buy a 5,000 bushel corn future from B2, who then might buy a 6,000 bushel corn future from B1; in this example, 1,000 bushels of corn remain unsettled between B1 and B2. Of course, the two brokers could offset the remaining 1,000 bushel contract if B2 sold a 1,000 bushel corn future to B1. But what if B2 had already sold a 1,000 bushel corn future to B3, who had sold a 1,000 bushel corn future to B1? In this case, each broker’s net futures market position is offset, but all three must meet in order to settle their respective positions. Brokers referred to such a meeting as a ring settlement. Finally, if, in this example, B1 and B3 did not have positions with each other, B2 could settle her position if she transferred her commitment (which she has with B1) to B3. Brokers referred to this method as a transfer settlement. In either ring or transfer settlements, brokers had to find other brokers who held and wished to settle open counter-positions. Often brokers used runners to search literally the offices and corridors for the requisite counter-parties (see Hoffman 1932, 185-200). 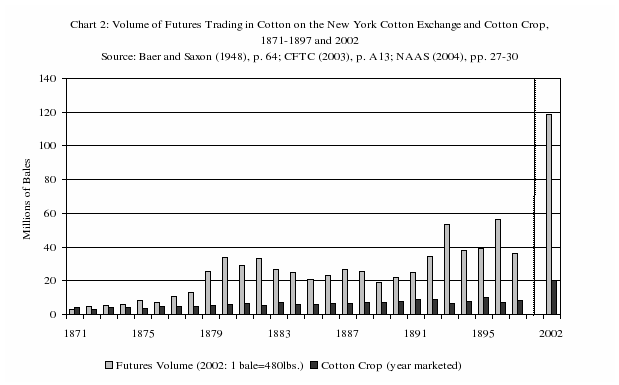 Finally, the transformation in Chicago grain markets from forward to futures trading occurred almost simultaneously in New York cotton markets. Forward contracts for cotton traded in New York (and Liverpool, England) by the 1850s. And, like Chicago, organized trading in cotton futures began on the New York Cotton Exchange in about 1870; rules and procedures formalized the practice in 1872. Futures trading on the New Orleans Cotton Exchange began around 1882 (Hieronymus 1977, 77). Other successful nineteenth century futures exchanges include the New York Produce Exchange, the Milwaukee Chamber of Commerce, the Merchant’s Exchange of St. Louis, the Chicago Open Board of Trade, the Duluth Board of Trade, and the Kansas City Board of Trade (Hoffman 1920, 33; see Peck 1985, 9). Data on grain futures volume prior to the 1880s are not available (Hoffman 1932, 30). Though in the 1870s “[CBT] officials openly admitted that there was no actual delivery of grain in more than ninety percent of contracts” (Lurie 1979, 59). Indeed, Chart 1 demonstrates that trading was relatively voluminous in the nineteenth century. An annual average of 23,600 million bushels of grain futures traded between 1884 and 1888, or eight times the annual average amount of crops produced during that period. By comparison, an annual average of 25,803 million bushels of grain futures traded between 1966 and 1970, or four times the annual average amount of crops produced during that period. 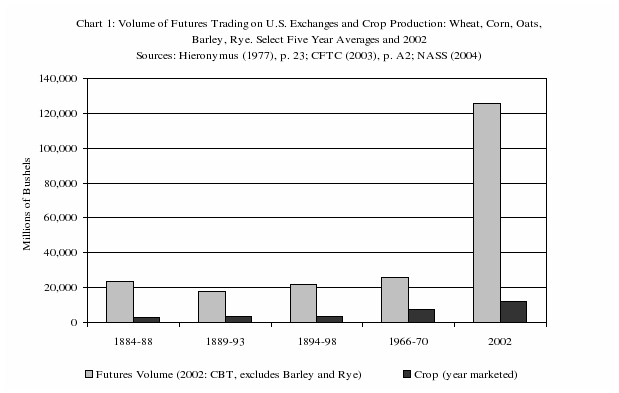 In 2002, futures volume outnumbered crop production by a factor of eleven. The comparable data for cotton futures are presented in Chart 2. Again here, trading in the nineteenth century was significant. To wit, by 1879 futures volume had outnumbered production by a factor of five, and by 1896 this factor had reached eight. Nineteenth century observers of early U.S. futures markets either credited them for stabilizing food prices, or discredited them for wagering on, and intensifying, the economic hardships of Americans (Baer and Saxon 1949, 12-20, 56; Chandler 1977, 212; Ferris 1988, 88; Hoffman 1932, 5; Lurie 1979, 53, 115). To be sure, the performance of early futures markets remains relatively unexplored. The extant research on the subject has generally examined this performance in the context of two perspectives on the theory of efficiency: the price of storage and futures price efficiency more generally. Holbrook Working pioneered research into the price of storage – the relationship, at a point in time, between prices (of storable agricultural commodities) applicable to different future dates (Working 1949, 1254).12 For example, what is the relationship between the current spot price of wheat and the current September 2004 futures price of wheat? Or, what is the relationship between the current September 2004 futures price of wheat and the current May 2005 futures price of wheat? Working reasoned that these prices could not differ because of events that were expected to occur between these dates. For example, if the May 2004 wheat futures price is less than the September 2004 price, this cannot be due to, say, the expectation of a small harvest between May 2004 and September 2004. On the contrary, traders should factor such an expectation into both May and September prices. And, assuming that they do, then this difference can only reflect the cost of carrying – storing – these commodities over time.13 Though this strict interpretation has since been modified somewhat (see Peck 1985, 44). So, for example, the September 2004 price equals the May 2004 price plus the cost of storing wheat between May 2004 and September 2004. If the difference between these prices is greater or less than the cost of storage, and the market is efficient, arbitrage will bring the difference back to the cost of storage – e.g., if the difference in prices exceeds the cost of storage, then traders can profit if they buy the May 2004 contract, sell the September 2004 contract, take delivery in May and store the wheat until September. Working (1953) demonstrated empirically that the theory of the price of storage could explain quite satisfactorily these inter-temporal differences in wheat futures prices at the CBT as early as the late 1880s (Working 1953, 556). Many contemporary economists tend to focus on futures price efficiency more generally (for example, Beck 1994; Kahl and Tomek 1986; Kofi 1973; McKenzie, et al. 2002; Tomek and Gray, 1970). That is to say, do futures prices shadow consistently (but not necessarily equal) traders’ rational expectations of future spot prices? Here, the research focuses on the relationship between, say, the cash price of wheat in September 2004 and the September 2004 futures price of wheat quoted two months earlier in July 2004. Figure 1illustrates the behavior of corn futures prices and their corresponding spot prices between 1877 and 1890. The data consist of the average month t futures price in the last full week of month t-2 and the average cash price in the first full week of month t.
The futures price and its corresponding spot price need not be equal; futures price efficiency does not mean that the futures market is clairvoyant. But, a difference between the two series should exist only because of an unpredictable forecast error and a risk premium – futures prices may be, say, consistently below the expected future spot price if long speculators require an inducement, or premium, to enter the futures market. Recent work finds strong evidence that these early corn (and corresponding wheat) futures prices are, in the long run, efficient estimates of their underlying spot prices (Santos 2002, 35). Although these results and Working’s empirical studies on the price of storage support, to some extent, the notion that early U.S. futures markets were efficient, this question remains largely unexplored by economic historians. The two sides and the telegraph companies fought in the courts for decades over access to these price quotes; the CBT’s very survival hung in the balance. After roughly twenty years of litigation, the Supreme Court of the U.S. effectively ruled in favor of the Chicago Board of Trade and against bucket shops (Board of Trade of the City of Chicago v. Christie Grain & Stock Co., 198 U.S. 236, 25 Sup. Ct. (1905)). Bucket shops disappeared completely by 1915 (Hieronymus 1977, 90). The anti-option movement, the bucket shop controversy and the American public’s discontent with speculation masks an ironic reality of futures trading: it escaped government regulation until after the First World War; though early exchanges did practice self-regulation or administrative law.16 The absence of any formal governmental oversight was due in large part to two factors. First, prior to 1895, the opposition tried unsuccessfully to outlaw rather than regulate futures trading. Second, strong agricultural commodity prices between 1895 and 1920 weakened the opposition, who blamed futures markets for low agricultural commodity prices (Hieronymus 1977, 313). Grain prices fell significantly by the end of the First World War, and opposition to futures trading grew once again (Hieronymus 1977, 313). In 1922 the U.S. Congress enacted the Grain Futures Act, which required exchanges to be licensed, limited market manipulation and publicized trading information (Leuthold 1989, 369).17 However, regulators could rarely enforce the act because it enabled them to discipline exchanges, rather than individual traders. To discipline an exchange was essentially to suspend it, a punishment unfit (too harsh) for most exchange-related infractions. The Commodity Exchange Act of 1936 enabled the government to deal directly with traders rather than exchanges. It established the Commodity Exchange Authority (CEA), a bureau of the U.S. Department of Agriculture, to monitor and investigate trading activities and prosecute price manipulation as a criminal offense. The act also: limited speculators’ trading activities and the sizes of their positions; regulated futures commission merchants; banned options trading on domestic agricultural commodities; and restricted futures trading – designated which commodities were to be traded on which licensed exchanges (see Hieronymus 1977; Leuthold, et al. 1989). Although Congress amended the Commodity Exchange Act in 1968 in order to increase the regulatory powers of the Commodity Exchange Authority, the latter was ill-equipped to handle the explosive growth in futures trading in the 1960s and 1970s. So, in 1974 Congress passed the Commodity Futures Trading Act, which created far-reaching federal oversight of U.S. futures trading and established the Commodity Futures Trading Commission (CFTC). Like the futures legislation before it, the Commodity Futures Trading Act seeks “to ensure proper execution of customer orders and to prevent unlawful manipulation, price distortion, fraud, cheating, fictitious trades, and misuse of customer funds” (Leuthold, et al. 1989, 34). Unlike the CEA, the CFTC was given broad regulator powers over all futures trading and related exchange activities throughout the U.S. The CFTC oversees and approves modifications to extant contracts and the creation and introduction of new contracts. The CFTC consists of five presidential appointees who are confirmed by the U.S. Senate. The Futures Trading Act of 1982 amended the Commodity Futures Trading Act of 1974. The 1982 act legalized options trading on agricultural commodities and identified more clearly the jurisdictions of the CFTC and Securities and Exchange Commission (SEC). The regulatory overlap between the two organizations arose because of the explosive popularity during the 1970s of financial futures contracts. Today, the CFTC regulates all futures contracts and options on futures contracts traded on U.S. futures exchanges; the SEC regulates all financial instrument cash markets as well as all other options markets. Finally, in 2000 Congress passed the Commodity Futures Modernization Act, which reauthorized the Commodity Futures Trading Commission for five years and repealed an 18-year old ban on trading single stock futures. The bill also sought to increase competition and “reduce systematic risk in markets for futures and over-the-counter derivatives” (H.R. 5660, 106th Congress 2nd Session). The growth in futures trading has been explosive in recent years (Chart 3). Futures trading extended beyond physical commodities in the 1970s and 1980s – currency futures in 1972; interest rate futures in 1975; and stock index futures in 1982 (Silber 1985, 83). The enormous growth of financial futures at this time was likely because of the breakdown of the Bretton Woods exchange rate regime, which essentially fixed the relative values of industrial economies’ exchange rates to the American dollar (see Bordo and Eichengreen 1993), and relatively high inflation from the late 1960s to the early 1980s. Flexible exchange rates and inflation introduced, respectively, exchange and interest rate risks, which hedgers sought to mitigate through the use of financial futures. Finally, although futures contracts on agricultural commodities remain popular, financial futures and options dominate trading today. Trading volume in metals, minerals and energy remains relatively small. Trading volume in agricultural futures contracts first dropped below 50% in 1982. By 1985 this volume had dropped to less than one fourth all trading. In the same year the volume of futures trading in the U.S. Treasury bond contract alone exceeded trading volume in all agricultural commodities combined (Leuthold et al. 1989, 2). Today exchanges in the U.S. actively trade contracts on several underlying assets (Table 1). These range from the traditional – e.g., agriculture and metals – to the truly innovative – e.g. the weather. The latter’s payoff varies with the number of degree-days by which the temperature in a particular region deviates from 65 degrees Fahrenheit. Source: Bodie, Kane and Marcus (2005), p. 796. Table 2 provides a list of today’s major futures exchanges. Source: Wall Street Journal, 5/12/2004, C16. Modern trading differs from its nineteenth century counterpart in other respects as well. First, the popularity of open outcry trading is waning. For example, today the CBT executes roughly half of all trades electronically. And, electronic trading is the rule, rather than the exception throughout Europe. Second, today roughly 99% of all futures contracts are settled prior to maturity. 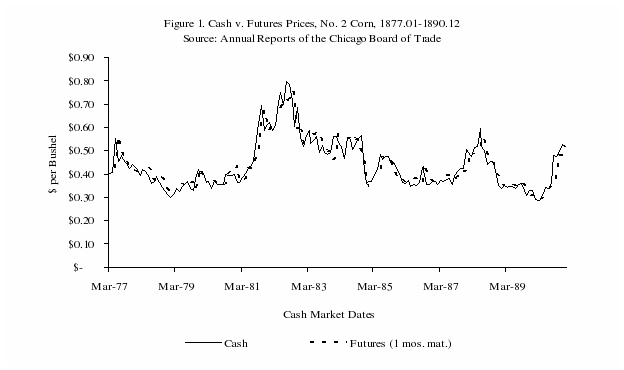 Third, in 1982 the Commodity Futures Trading Commission approved cash settlement – delivery that takes the form of a cash balance – on financial index and Eurodollar futures, whose underlying assets are not deliverable, as well as on several non-financial contracts including lean hog, feeder cattle and weather (Carlton 1984, 253). And finally, on Dec. 6, 2002, the Chicago Mercantile Exchange became the first publicly traded financial exchange in the U.S.
Baer, Julius B. and Olin. G. Saxon. Commodity Exchanges and Futures Trading. New York: Harper & Brothers, 1949. Bodie, Zvi, Alex Kane and Alan J. Marcus. Investments. New York: McGraw-Hill/Irwin, 2005. Bordo, Michael D. and Barry Eichengreen, editors. A Retrospective on the Bretton Woods System: Lessons for International Monetary Reform. Chicago: University of Chicago Press, 1993. Boyle, James. E. Speculation and the Chicago Board of Trade. New York: MacMillan Company, 1920. Carlton, Dennis W. “Futures Markets: Their Purpose, Their History, Their Growth, Their Successes and Failures.” Journal of Futures Markets 4, no. 3 (1984): 237-271. Chicago Board of Trade Bulletin. The Development of the Chicago Board of Trade. Chicago: Chicago Board of Trade, 1936. Chandler, Alfred. D. The Visible Hand: The Managerial Revolution in American Business. Cambridge: Harvard University Press, 1977. Clark, John. G. The Grain Trade in the Old Northwest. Urbana: University of Illinois Press, 1966. Commodity Futures Trading Commission. Annual Report. Washington, D.C. 2003. Dies, Edward. J. The Wheat Pit. Chicago: The Argyle Press, 1925. Ferris, William. G. The Grain Traders: The Story of the Chicago Board of Trade. East Lansing, MI: Michigan State University Press, 1988. Hieronymus, Thomas A. Economics of Futures Trading for Commercial and Personal Profit. New York: Commodity Research Bureau, Inc., 1977. 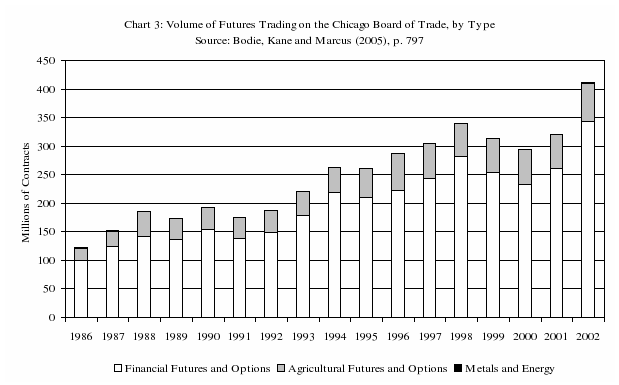 Hoffman, George W. Futures Trading upon Organized Commodity Markets in the United States. Philadelphia: University of Pennsylvania Press, 1932. Leuthold, Raymond M., Joan C. Junkus and Jean E. Cordier. The Theory and Practice of Futures Markets. Champaign, IL: Stipes Publishing L.L.C., 1989. Lurie, Jonathan. The Chicago Board of Trade 1859-1905. Urbana: University of Illinois Press, 1979. National Agricultural Statistics Service. “Historical Track Records.” Agricultural Statistics Board, U.S. Department of Agriculture, Washington, D.C. April 2004. Norris, Frank. The Pit: A Story of Chicago. New York, NY: Penguin Group, 1903. Odle, Thomas. “Entrepreneurial Cooperation on the Great Lakes: The Origin of the Methods of American Grain Marketing.” Business History Review 38, (1964): 439-55. Peck, Anne E., editor. Futures Markets: Their Economic Role. Washington D.C.: American Enterprise Institute for Public Policy Research, 1985. Peterson, Arthur G. “Futures Trading with Particular Reference to Agricultural Commodities.” Agricultural History 8, (1933): 68-80. Pierce, Bessie L. A History of Chicago: Volume III, the Rise of a Modern City. New York: Alfred A. Knopf, 1957. Rothstein, Morton. “The International Market for Agricultural Commodities, 1850-1873.” In Economic Change in the Civil War Era, edited by David. T. Gilchrist and W. David Lewis, 62-71. Greenville DE: Eleutherian Mills-Hagley Foundation, 1966. Rothstein, Morton. “Frank Norris and Popular Perceptions of the Market.” Agricultural History 56, (1982): 50-66. Santos, Joseph. “Did Futures Markets Stabilize U.S. Grain Prices?” Journal of Agricultural Economics 53, no. 1 (2002): 25-36. Silber, William L. “The Economic Role of Financial Futures.” In Futures Markets: Their Economic Role, edited by Anne E. Peck, 83-114. Washington D.C.: American Enterprise Institute for Public Policy Research, 1985. Stein, Jerome L. The Economics of Futures Markets. Oxford: Basil Blackwell Ltd, 1986. Taylor, Charles. H. History of the Board of Trade of the City of Chicago. Chicago: R. O. Law, 1917. Werner, Walter and Steven T. Smith. Wall Street. New York: Columbia University Press, 1991. Williams, Jeffrey C. “The Origin of Futures Markets.” Agricultural History 56, (1982): 306-16. Working, Holbrook. “The Theory of the Price of Storage.” American Economic Review 39, (1949): 1254-62. Working, Holbrook. “Hedging Reconsidered.” Journal of Farm Economics 35, (1953): 544-61. 2 The vast majority of contracts are offset. Outright delivery occurs when the buyer receives from, or the seller “delivers” to the exchange a title of ownership, and not the actual commodity or financial security – the urban legend of the trader who neglected to settle his long position and consequently “woke up one morning to find several car loads of a commodity dumped on his front yard” is indeed apocryphal (Hieronymus 1977, 37)! 3 Nevertheless, forward contracts remain popular today (see Peck 1985, 9-12). 4 The importance of New Orleans as a point of departure for U.S. grain and provisions prior to the Civil War is unquestionable. According to Clark (1966), “New Orleans was the leading export center in the nation in terms of dollar volume of domestic exports, except for 1847 and a few years during the 1850s, when New York’s domestic exports exceeded those of the Crescent City” (36). 5 This area was responsible for roughly half of U.S. wheat production and a third of U.S. corn production just prior to 1860. Southern planters dominated corn output during the early to mid- 1800s. 6 Millers milled wheat into flour; pork producers fed corn to pigs, which producers slaughtered for provisions; distillers and brewers converted rye and barley into whiskey and malt liquors, respectively; and ranchers fed grains and grasses to cattle, which were then driven to eastern markets. 7 Significant advances in transportation made the grain trade’s eastward expansion possible, but the strong and growing demand for grain in the East made the trade profitable. The growth in domestic grain demand during the early to mid-nineteenth century reflected the strong growth in eastern urban populations. Between 1820 and 1860, the populations of Baltimore, Boston, New York and Philadelphia increased by over 500% (Clark 1966, 54). Moreover, as the 1840’s approached, foreign demand for U.S. grain grew. Between 1845 and 1847, U.S. exports of wheat and flour rose from 6.3 million bushels to 26.3 million bushels and corn exports grew from 840,000 bushels to 16.3 million bushels (Clark 1966, 55). 8 Wheat production was shifting to the trans-Mississippi West, which produced 65% of the nation’s wheat by 1899 and 90% by 1909, and railroads based in the Lake Michigan port cities intercepted the Mississippi River trade that would otherwise have headed to St. Louis (Clark 1966, 95). Lake Michigan port cities also benefited from a growing concentration of corn production in the West North Central region – Iowa, Kansas, Minnesota, Missouri, Nebraska, North Dakota and South Dakota, which by 1899 produced 40% percent of the country’s corn (Clark 1966, 4). 9 Corn had to be dried immediately after it was harvested and could only be shipped profitably by water to Chicago, but only after rivers and lakes had thawed; so, country merchants stored large quantities of corn. On the other hand, wheat was more valuable relative to its weight, and it could be shipped to Chicago by rail or road immediately after it was harvested; so, Chicago merchants stored large quantities of wheat. 10 This is consistent with Odle (1964), who adds that “the creators of the new system of marketing [forward contracts] were the grain merchants of the Great Lakes” (439). However, Williams (1982) presents evidence of such contracts between Buffalo and New York City as early as 1847 (309). To be sure, Williams proffers an intriguing case that forward and, in effect, future trading was active and quite sophisticated throughout New York by the late 1840s. Moreover, he argues that this trading grew not out of activity in Chicago, whose trading activities were quite primitive at this early date, but rather trading in London and ultimately Amsterdam. Indeed, “time bargains” were common in London and New York securities markets in the mid- and late 1700s, respectively. A time bargain was essentially a cash-settled financial forward contract that was unenforceable by law, and as such “each party was forced to rely on the integrity and credit of the other” (Werner and Smith 1991, 31). According to Werner and Smith, “time bargains prevailed on Wall Street until 1840, and were gradually replaced by margin trading by 1860” (68). They add that, “margin trading … had an advantage over time bargains, in which there was little protection against default beyond the word of another broker. Time bargains also technically violated the law as wagering contracts; margin trading did not” (135). Between 1818 and 1840 these contracts comprised anywhere from 0.7% (49-day average in 1830) to 34.6% (78-day average in 1819) of daily exchange volume on the New York Stock & Exchange Board (Werner and Smith 1991, 174). 11 Of course, forward markets could and indeed did exist in the absence of both grading standards and formal exchanges, though to what extent they existed is unclear (see Williams 1982). 12 In the parlance of modern financial futures, the term cost of carry is used instead of the term storage. For example, the cost of carrying a bond is comprised of the cost of acquiring and holding (or storing) it until delivery minus the return earned during the carry period. 13 More specifically, the price of storage is comprised of three components: (1) physical costs such as warehouse and insurance; (2) financial costs such as borrowing rates of interest; and (3) the convenience yield – the return that the merchant, who stores the commodity, derives from maintaining an inventory in the commodity. The marginal costs of (1) and (2) are increasing functions of the amount stored; the more the merchant stores, the greater the marginal costs of warehouse use, insurance and financing. Whereas the marginal benefit of (3) is a decreasing function of the amount stored; put differently, the smaller the merchant’s inventory, the more valuable each additional unit of inventory becomes. Working used this convenience yield to explain a negative price of storage – the nearby contract is priced higher than the faraway contract; an event that is likely to occur when supplies are exceptionally low. In this instance, there is little for inventory dealers to store. Hence, dealers face extremely low physical and financial storage costs, but extremely high convenience yields. The price of storage turns negative; essentially, inventory dealers are willing to pay to store the commodity. 14 Norris’ protagonist, Curtis Jadwin, is a wheat speculator emotionally consumed and ultimately destroyed, while the welfare of producers and consumers hang in the balance, when a nineteenth century CBT wheat futures corner backfires on him. 15 One particularly colorful incident in the controversy came when the Supreme Court of Illinois ruled that the CBT had to either make price quotes public or restrict access to everyone. When the Board opted for the latter, it found it needed to “prevent its members from running (often literally) between the [CBT and a bucket shop next door], but with minimal success. Board officials at first tried to lock the doors to the exchange…However, after one member literally battered down the door to the east side of the building, the directors abandoned this policy as impracticable if not destructive” (Lurie 1979, 140). 16 Administrative law is “a body of rules and doctrines which deals with the powers and actions of administrative agencies” that are organizations other than the judiciary or legislature. These organizations affect the rights of private parties “through either adjudication, rulemaking, investigating, prosecuting, negotiating, settling, or informally acting” (Lurie 1979, 9). 17 In 1921 Congress passed The Futures Trading Act, which was declared unconstitutional.